Who knew you could use studs in bridal design? Francesca Stone of FallforDIY showed you can when she created this incredibly modern bridal headpiece. She added simple wire loops to some of the studs which allowed for the attachment of the pearls and crystals! The design is reminiscent of the incredible Indian wedding hair jewelry. You do not have to use studs or even glue the crystals onto plastic strips. Use your creativity and use other materials. The metal headband is a good base for even beadwork. 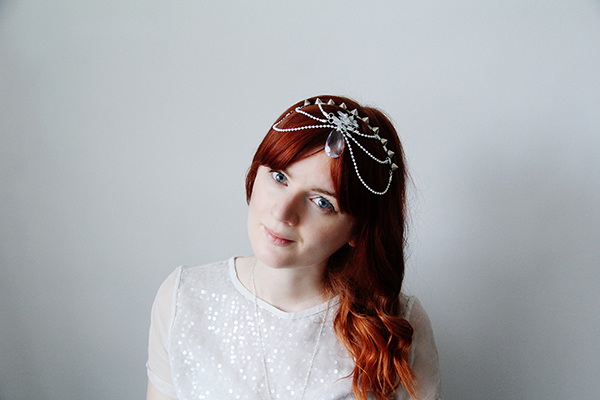 Add beaded loops and then have fun creating the front of the headpiece.